It’s no great secret that I have a love affair with stationery, I have a complete section in my stationery drawer dedicated to coloured BiC pens (who says you have to write in black or blue?). Roo has inherited my love of stationery and Mr. Boo knows that if he ever loses us in a department store to look in the stationery section first. With the summer holidays approaching it is time to start thinking about what we are going to get up to and plan for the days we are at home (either through choice or the summer rain storms). I’ve always loved colouring, there is something so therapeutic about passing the time away colouring in a beautiful picture. You get that sense of accomplishment when you have finished too. This summer Roo and Tigger have been lucky enough to receive the BiC Kids Alvin & the Chipmunks Colouring Activity Set to help keep them occupied and for them to let their creative side flow. Encourage your little one’s creative side with this 80 piece Alvin and the Chipmunks BIC Kids Colouring Activity set. Featuring a selection of versatile colouring implements to help your child’s imagination run wild, this set has something for everyone. The great thing about this activity set is that it includes everything you need all packaged within a carry case with handle so you can grab it and pop it in the car or take with you to family or friends houses. 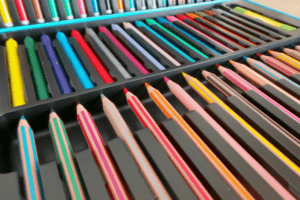 With a selection of different pens, pencils, and crayons it offers the choice depending on your preference when it comes to colouring. The activity sheets add that fun factor and saves them having to think of what they would like to draw or create. Plus is saves me as I usually forget to bring the paper with me (oops). 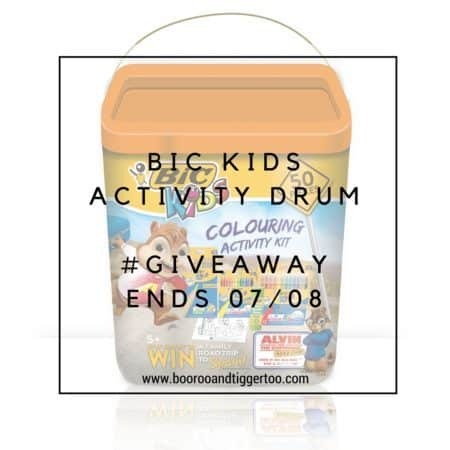 To help you have a summer of colouring fun, BiC Kids have kindly offered us a BiC Kids Activity Drum to giveaway to one lucky reader. Ah this is a lovely prize, I’m a stationery geek and the kids have inherited my love of it!